Timbuktu, the city of 333 Saints, the pearl of Africa, the cradle of holiness and knowledge was in the last 1 1/2 years under siege by a most violent and wicked Salafi group. It destroyed its very core: almost all maqqams of the saints have been brutally raised to the ground.The inhabitants lived in constant fear and had to witness how the holiest of holy was desecrated and erased from history while they were forced to live in the reality of a heartless, unauthorised and dangerous form of Islam with no mercy, no respect and no love.. Things have now changed, elections have been held, but life will take a long time to return to normal. There are still no banks and many of the handicapped ladies have not yet returned from Bamako, because they don't know if they can trust the peace. 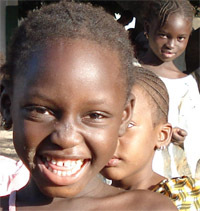 Healing Hearts has been supporting 36 disabled ladies in Timbuktu for the last 8 years. 14 of them are still living as refugees in the capital Bamako, 22 remain in Timbuktu. 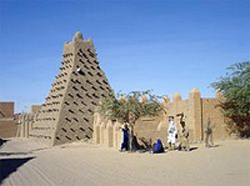 Since the events of the last years, Timbuktu has lost its main source of income: tourism, and its infrastructure has been destroyed. It has sunk into total poverty and the ones most suffering are the disabled. We continue to support them by sending money for 50 kg bags of rice (cost £25) to each of them as often as possible.